A week ago, I called my husband on a business trip in China for the urgent assistance in locating my DVD of Aladdin. “I know,” I said, “But our daughter is singing a song from Aladdin in summer camp this week and she really, really needs to see this movie.” She’d seen it once before, years prior; my son hadn’t seen it ever. It was an unforgivable omission, one I felt an almost irresistible need to fix. So we sat down and watched it, this movie that came out when I was still in high school, and I marvelled. The computer animation looked so dated now, the pop culture references flying over the kids’ head like a magic carpet. But it worked. It still worked, and it was all because of Robin Williams’ genius. He wasn’t a person who had been in my thoughts much in recent times, though he was a fixture of my childhood from Mork and Mindy through Good Will Hunting, Patch Adams, Good Morning Vietnam. Watching Aladdin rekindled my interest in his unique body of work and I’ve been on a Robin Williams binge this last week- Aladdin followed by The Birdcage, Good Morning Vietnam, and Mrs. Doubtfire scheduled for later this week. Robin had, in addition to his brilliant improvisation and manic energy, an exquisite ability to layer melancholy and sweet, delving into the deepest pains of humanity in a way that made you hopeful despite its ugliness, a compassion that balanced the sometimes cruel realities of being alive. He inhabited those characters in a way few others could. Williams and Alan Alda, the actors that defined the genre for me. Depression is not a fight that can be won, a demon vanquished. It’s simply there, a weight people carry around and manage the best they can. Robin wrought his depression like a kettlebell, swinging up and down and up and down and in the process put out the energy that was-is- his legacy. I can only imagine how exhausting it must have been, but he did it, over and over, though his life. He made it work for him. He was a dog lover, you know. Of course he was, right? When you live with that kind of pressure and expectation from those around you to be on all the time- why aren’t you saying something funny?- the presence of an unconditionally accepting creature is a comfort and a joy. Having so recently been drawn back into his life and his work and his bright eyes that never entirely belied the stormy grey beneath, I was so enjoying re-experiencing the creative rush of his work, immersed in how much he gave of himself to make others smile. Today was a shock, in many ways. And I guess that is why so many of us are so insanely devastated, at least I know I am. He always made his depression work for him, turning the swirling rivulets of thought and extremes in his brain and transforming them into art. I see in the world the same sort of wide eyed despair that followed Kurt Cobain’s death, that sense of hope snuffed out. I think a lot of people looked up to them both. They were proof positive of the transformative power of creative will, but while Kurt succumbed at a young age, Robin managed to persevere, and that made him even more infallible in our eyes. I thought he had it figured out. With all his success and fortune and mastery of substance abuse, he was a tick mark on the list of success stories with this particular type of chronic disease. I thought he had won the battle. I was wrong. We are reminded today, yet again, that depression is a fire that never gets put out completely, a smolder you can never turn your back on. Never, ever. We’ll never know why this time was different, why today was insurmountable when every other day was a day to soldier on, but the world is all the dimmer with the Genie flown back home to the Cave of Wonders, beyond the horizon and beyond our grasp. All we can do now is celebrate the shimmer he left in his wake. Look out for one another, friends, help one another. It’s a rough world out there, and we need all the joy we can get. We need each other. Tolkien said it best: “Despair is only for those who see the end beyond all doubt. We do not.” We do not. RIP Robin, kind sir. Thank you. Adam Vasquez, a San Antonio 11-year-old with Down syndrome, has many great qualities. One is his caring nature and desire to help others. That’s why Adam’s mom, Michelle Morales, thought a dog would be a perfect companion for the boy. But not just any dog: when Morales spied a paralyzed yellow lab mix named Angel on the City of San Antonio Animal Care Services Facebook page, she thought she might be a good choice for the nurturing boy. According to the San Antonio Express-News, spinal injuries from a car accident in March paralyzed Angel from the waist down and she now gets around using a dog wheelchair. The staff at ACS named her Angel to fit her sweet personality. Doggie tips for cold weather obviously isn’t anything you care about if you live in one of the southwestern states or Florida, but for the rest of the dog owners it’s important information to help keep their dog safe and warm all winter long. If the weather outside is too cold for you, it’s also going to be too cold for your dog. If you live in a part of the country that has frigid winters, your dog should be kept indoors as much as possible during the cold weather months and never ever leave your dog alone in the car when the mercury drops below freezing. During winter storms, city crews often put de-icers on sidewalks and parking areas to prevent people from slipping and falling. If a dog should get thirsty and decide to lap up some of the ice that has melted from the application of a de-icer, the water melt will be toxic and can cause sickness or possible death in a pet. Prolonged exposure to dry, cold air and chilly rain, and the sleet and snow of winter can cause problems for a dog. Repeatedly coming out of the cold into dry heat can leave a dog with dry, itchy, flaking skin or severely chapped paws. Keeping your home humidified and drying your pet as soon as it comes out of the cold weather will keep it warm and comfortable. If your weather is really cold and your dog has short hair, you can keep it warm by buying a pet sweater or coat to help your dog retain body heat and prevent its skin from getting too dry. It’s common to see small dogs dressed for the worst of winter, but size doesn’t matter when it comes to cold weather and your big dog will be just as comfortable in a warm and toasty sweater or coat. When you take your dog for a walk in winter weather it’s also a good idea to have it wear winter booties with warm inner linings to help minimize contact with salt crystals which can be painful to a dog’s paws. It’s also the best way to keep your dog from stepping in poisonous anti-freeze and other chemicals used to melt ice, and inadvertently licking the toxic mix off its paws after returning home. It’s not a good idea to give your dog frequent baths during cold winter weather. Bathing a dog too often removes essential oils from the skin and increases the chance its skin will become dry and flaky. If you must bathe your dog, use a moisturizing shampoo each time and dry the dog well. Dogs burn more energy trying to stay warm in wintertime and this can result in dehydration. You can avoid this problem by feeding your dog just a little bit more food during cold weather (what dog is going to refuse extra food!) and be sure there is always fresh water for it to drink. I hope these doggie tips for cold weather will help some of you pet owners who suffer through those long, cold winters. To me it’s always been a symbol of strength and solidarity. Just open your palm and it’s there. It’s loyalty, allegiance, and at times a lean-to, the late at night shelter in the wilderness of uncertainty. Murphy used to paw me so much I called him Pez and I was the dispenser for whatever he needed and wanted. 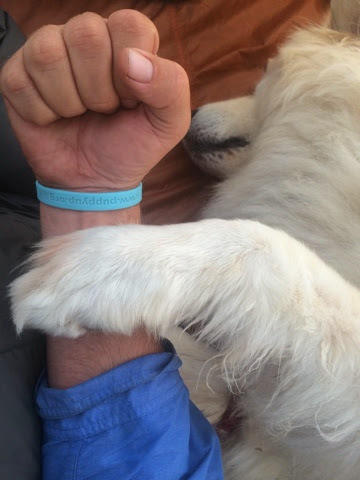 Today is the 3 month mark of our west coast walk and from my experience with Murphy I learned that the pyr paw sometimes means it’s time to tap out. Hudson cannot continue forward on this walk. Paw problems have plagued him from close to the outset and to our damnest extent we’ve tried to figure out why and exhausted all solutions. The cold damp climate? Non stop licking causing chronic inflammation and infection? Some say there are microscopic sand burrs on the coastline and a whole host of other speculations. But like any other father, still in the absence of a reason or a solution, a decision has to be made. Hudson is being picked up today and transported back to Memphis. Indiana and I will continue on with sadness in our hearts and the longing to be reunited will drive us the rest of the way. 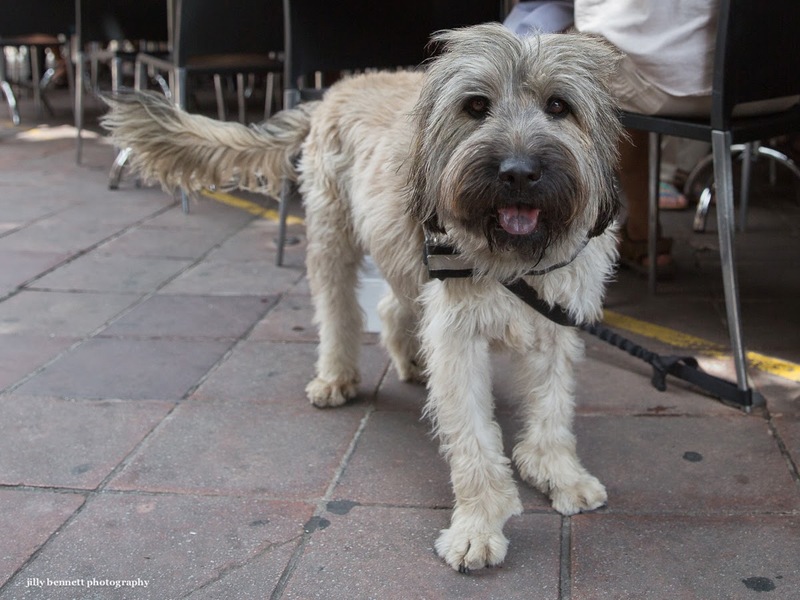 This is a Catalan Sheepdog I met in Cours Saleya in Nice. The breed came originally from the north of Spain. Note the pigmentation on his tongue. Cancer doesn’t have a conscience. It takes precious things from you and leaves a dark aftermath. I figured that out when Malcolm exited this world. For months I stood in a deep pit of sadness with so many unanswered questions. It didn’t take long for me to look around and see others sitting in that dirt right beside me. To honor the great undaunted spirits of our friends taken by cancer, I started a calendar back in 2009. It was a simple and beautiful way to make some sense of these dark experiences, and the goodness just keeps growing. People write to my foundation (Puppy Up) with their stories and pictures every year. 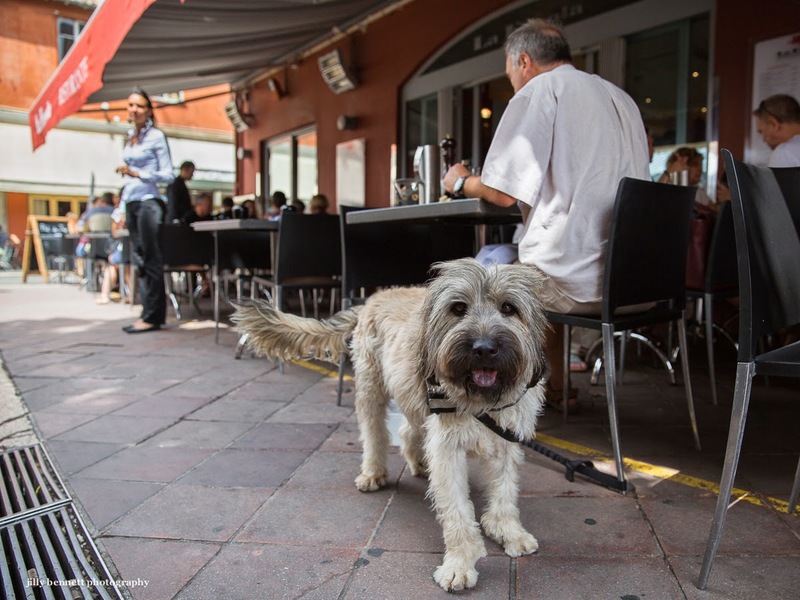 Puppy Up publishes the calendar and uses the proceeds to help fund major comparative oncology studies. It’s an overlooked but critical area of cancer research that can give us endless information. My own Murphy appeared on one cover. If you want to tell us your story and join the fight against cancer in people and companion animals, I’ve posted the rules below. Every single story helps, and we appreciate anything you can do. 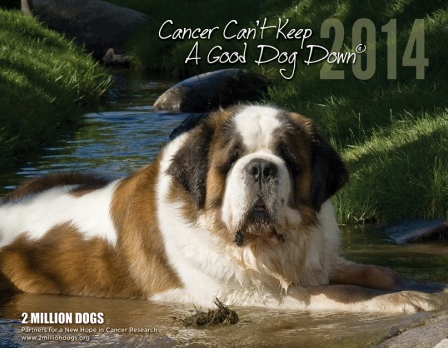 Welcome to the 2015 Cancer Can’t Keep a Good Dog Down Calendar Contest!This contest gives you a way to honor your canine cancer hero while helping the Puppy Up Foundation raise funds for cancer research to benefit pets and humans. Register your dog. Simply upload your dog’s story and photo. For best results, use the best high-resolution digital photo you have. Please also be prepared to submit a high resolution digital photo of the same image (minimum of 500kb) upon request for reproduction in the calendar. Then provide a brief summary of your dog’s story. The more you show your dog’s personality, the more votes you will receive! Who Can Enter? Anyone with a dog who currently has or has had cancer (living or passed) can enter, including dogs who have entered in previous 2 Million Dogs/Puppy Up calendar contests. Get started right now. Or for more info, keep reading. Your $ 10 registration becomes the first 10 votes for your dog. The 13 pets with the highest number of votes will win a Dog of the Month slot on the calendar. ALL photo entries will be included in our 2015 Calendar Photo Gallery. Your participation helps fund vital cancer research for dogs and humans. Begin here and follow the directions. Be sure to write down and remember your user name and password! For questions about the contest, please contact Erich Trapp at erich@puppyup.org. Where Do My Voting Dollars Go? Your voting dollars go to fund cutting-edge research in comparative oncology, that branch of research that benefits both companion animals and humans in our fight against cancer. What Makes a Puppy Up Calendar so Special? Puppy Up Foundation uses our annual calendar as an educational tool about a critical and often overlooked area of cancer research called comparative oncology. There are important clues in the connections between human and canine cancers, especially since the resulting treatments benefit both species. One of the best ways to call attention to the need for this research is by telling your stories and showing your photos. It also helps transform our losses into information that helps fight the world’s deadliest disease. Why Do I Need This Calendar (when it’s published)? First, every dog entered appears in the calendar. No one gets left behind. We have a whole section of gallery photos dedicated to all of the dogs entered into the contest in addition to our winners who are featured as each month’s “model.” We also include regular ‘people’ holidays and special dog holidays like National Puppy Day, Pet Theft Awareness Day, Take Your Dog to Work Day, World Animal Remembrance Month, Pet Cancer Awareness Month, etc. Each calendar is a one-of-a-kind keepsakes. Start right here today: look for the Register Here button on the left of the page. Click it and follow the directions.